San Diegans were in store for a rainy Saturday as another storm system sweeps the region, bringing showers through the weekend. The NBC 7 First Alert Forecast tracked showers moving into San Diego County just after midnight and through early Saturday morning. The National Weather Service said the most widespread rain would occur Saturday morning and afternoon. "Most of the rain will be on Saturday so you can plan around that," said NBC 7 Meteorologist Sheena Parveen. "I would say Sunday looks like mainly a cloudy day and we can't rule out a spotty shower." Potential rainfall from this Pacific storm system is estimated around 0.25-inch to 0.50-inch along San Diego's coast, with close to 1.5 inches possible further inland and in the mountains. The NWS said the storm would slicken roadways over the weekend, so motorists should take precautions. On Saturday morning, slick road conditions along northbound Interstate 805 near H Street in Chula Vista led to a crash involving four cars. One person was hurt in that incident. Then, just before 8:30 a.m., two women had to be pulled from an overturned SUV at the eastbound State Route 94 on-ramp at 28th Street in Grant Hill. Officials said speed and slick roads contributed to that crash as well. Meanwhile, Parveen said Saturday would also be breezy with winds increasing to nearly 25 mph along the cost and gusting near 40 mph in the mountains and deserts. The NWS issued a wind advisory Saturday, in effect from 10 a.m. to midnight for San Diego County’s mountains including Julian and Pine Valley. The NWS said southwest to west gusts would be between 20 and 30 mph, with occasional gusts to 55 mph. The strongest winds were forecasted for the afternoon and evening, diminishing into the night. The showers moved in as expected. 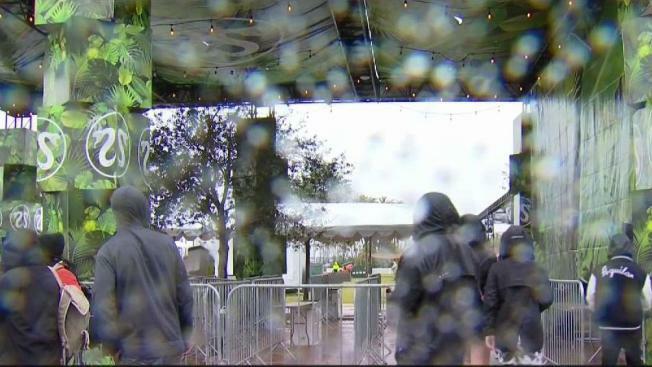 At around 7:15 a.m. Saturday, NBC 7’s Brooke Landau said heavy rain was hitting San Diego’s North County, including Encinitas. The storm was moving in an eastward direction and was expected to pummel the East County by around 8:30 a.m.
Landau said the rain would continue to push out into the mountains, bringing heavy rain to areas like Julian. This pattern continued through the morning. By lunchtime, Landau said some parts of the county would see “pockets of relief” in the midst of continued cloudy skies. Still, as the gray day persisted, the weekend storm didn’t stop people from enjoying San Diego. This included Bing Sacach, who was visiting from Kansas City for a 30th reunion with friends from college. Along the Embarcadero in downtown San Diego, music enthusiasts filed into Waterfront Park for the outdoor electronic/pop music festival, CRSSD. Luis Aguilar was determined to have a good time, rain or shine. By Saturday evening, Landau said showers would be lighter and less widespread. Parveen said conditions won’t completely dry out, leaving a slight chance for a shower on Sunday. Landau said those potential Sunday showers would be scattered. Next week, the NBC 7 First Alert Forecast shows another chance of rain, likely Tuesday, Wednesday, and Thursday. "The rainy pattern -- it doesn't look like it's done yet," Parveen added.